The value that I was exploring in this sculpture was excitement in life within the idea of 'Stimulation'. I wanted to look further into the pursuit of happiness and landed on the idea that our happiness and our identity is formed by our memories and the things we do, which is why the value of ‘excitement in life’ is so important. I often think that those incredible experiences that we have in our lives are overwhelming and almost seem too much to handle at times. 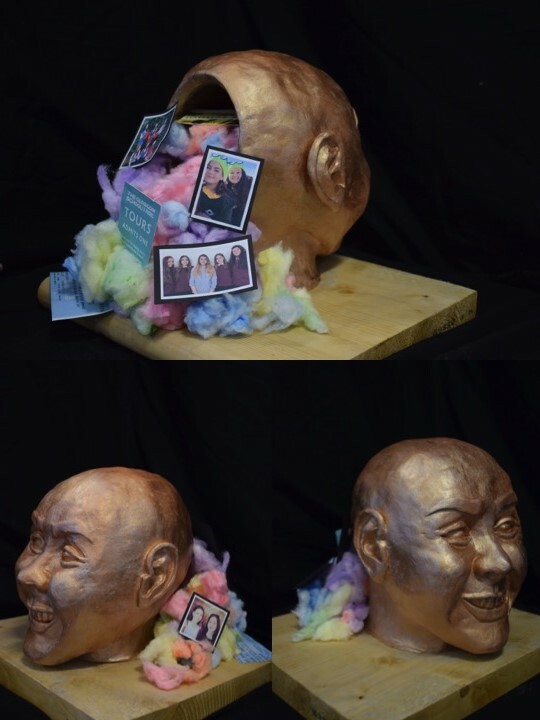 To communicate this in my sculpture, I had pictures and mementos pouring out of the mind to show our memories exploding and flooding out of us. As I wanted to show the happiness within as a positive and beautiful thing I used rainbow dyed cotton wool to balance them on and when contrasted with the plain gold head the wool demonstrated how it is what is inside us that it beautiful and important and stands out. In this way, the sculpture also looks at the importance of equality as the face has no gender or race, but is merely a positive thing.